The thing looks like a pack of cigarettes, but is in actual fact a pack of playing cards. Not that it says it’s a pack of play cards, though. Sometimes you wonder how… well, vomit can come boxed up so well and looking so “royalesque”. Thing is… there is a reason they decided to call this thing “puke”! It turns out that they wrote the thing out in Pinyin transliteration… in other words, this was Chinese but written in the Western alphabet! The “puke” here, then, is supposed to stand for “playing cards”, which, when written in Chinese characters (扑克), actually sounds like “pu ke” (or more like “poo kah”). 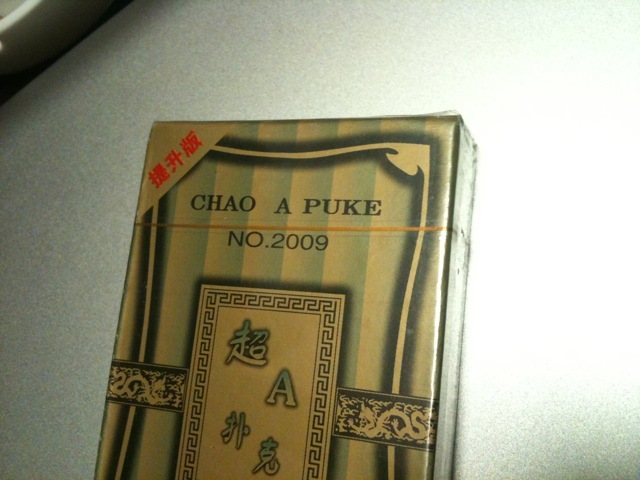 (I knew from the outset that this would be disgusting… puke… and now poo…) And what’s this Chao A bit? It’s supposed to mean that these were “best grade” playing cards, or you if you must, the best vomit on the market.